A laybye (Lay Bye, lay-by, layby) sale is a sale where the customer wants to pay off the items over a period. The goods are not released to the customer until final payment is received. To start a laybye contract, simply do the sale as usual but select a customer and instead of using the Pay button, click on the Menu button. Click on the 'Convert Sale to Laybye Contract'. The cashier can then select a customer (or create a new customer). The laybe contract will then be created and the laybye screen will open. The minium deposit can be set in the General Retail Settings. Click on Pay to do the first payment. The 'Amount to Pay' screen will open. Enter the first amount the customer wants to pay (it can't be less than the minimum amount). The pay screen will open up allowing the cashier to receive the payment. 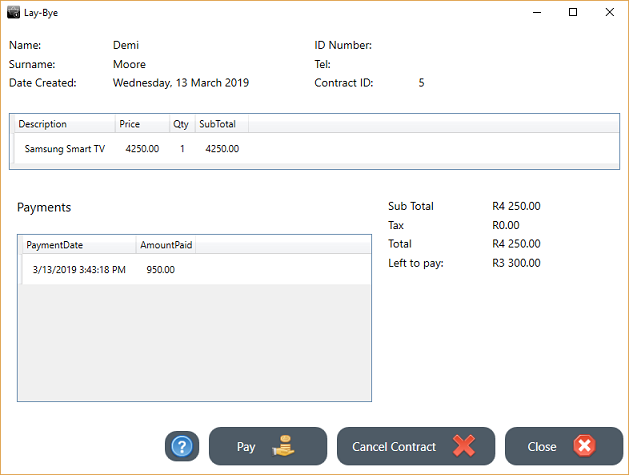 (The amount to pay can for example be 850 but the cashier can receive 900 - that is why the cashier first needs to specify the amount the customer wants to pay and then the actual amount received. A 'sale contract' for the customer. An internal slip. The internal slip can be attached to the goods for laybye's or send to the ordering/manufacturing department. Both slips can be fully customized in Print Layout. 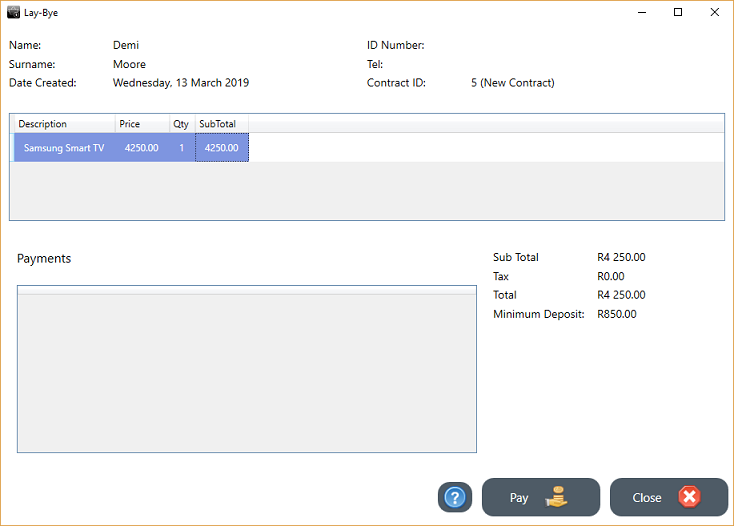 When the customer wants to do another payment, from the Retail module, click on the Menu button. The cashier will be able to select a customer. The laybye contract for that customer will open. 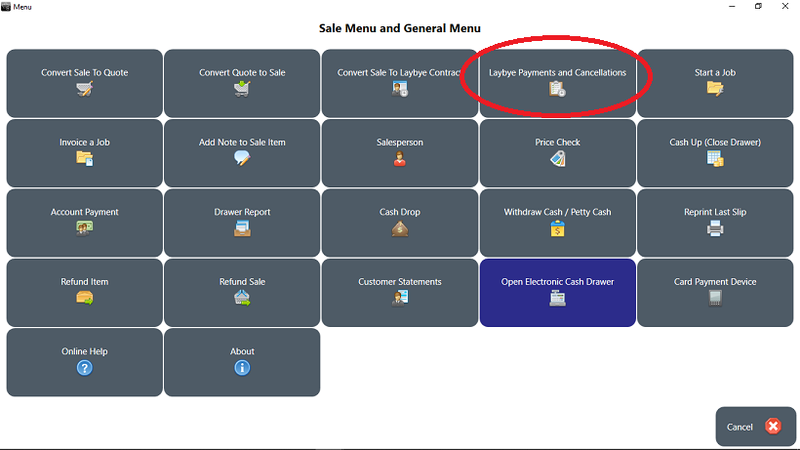 If the customer has more than one laybye contract the cashier will be able to select the correct one. The details of the contract will be displayed as well as all payments already made. The amount outstanding will also be displayed. The cashier can then receive another payment. Another payment slip will be printed. The contract can also be cancelled and the customer refunded using the 'Cancel Contract' button. Once the final payment is done the contract will be closed and the cashier will be informed to release the goods. The sale contract reports can be found at ROBOTILL Manager > Reports > Retail Specific > Laybye. The report can be filtered for 'Current', 'Completed' and cancelled.